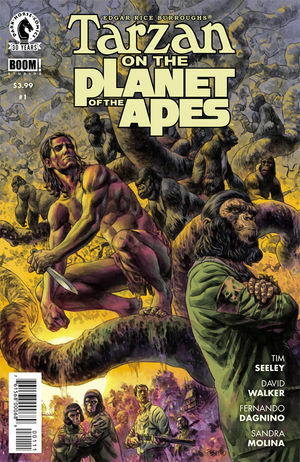 The Fellowship was fortunate enough to obtain a copy of TARZAN ON THE PLANET OF THE APES #1 from Dark Horse Comics and BOOM! Studios. Tim Seeley and David Walker write, Fernando Dagnino draws, Sandra Molina colors, and Nate Piekos of Blambot letters. A group of apes escaped the doomsday weapon in astronaut Taylor’s ship, but were thrown through some sort of portal into the past. They settled in the jungle and soon discovered a small human boy named Tarzan. Also, fast forward to modern times, where fully grown Tarzan battles against his ape brethren for the sake of the humans. He fights well, but is greatly outnumbered and is eventually captured by the ape general. Crossovers are growing in popularity these days, and this is one that makes sense in several ways. Tarzan’s choice between his lives, ape and human, is made quite a bit more complicated here, where it’s unclear who is the “good guys.” The story is necessarily complex (as time travel stories often are) but never confusing, and the art is really quite beautiful, with detailed jungle backgrounds and masterful fight scenes. There are plenty of familiar names to fans of both properties, and a story that brings it all together. This is definitely one to check out. TARZAN ON THE PLANET OF THE APES #1 is available now at your FLCS or at darkhorse.com.